Carbonara is a rich, creamy sauce that clings to pasta and tastes divine. 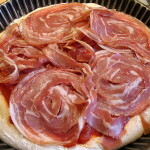 It originated in Italy where it is typically made with olive oil, garlic, eggs, cheese, and pancetta (Italian bacon). Pancetta is made from the same cut of meat as bacon, but the resemblance ends there. The flavor is distinctly Italian. 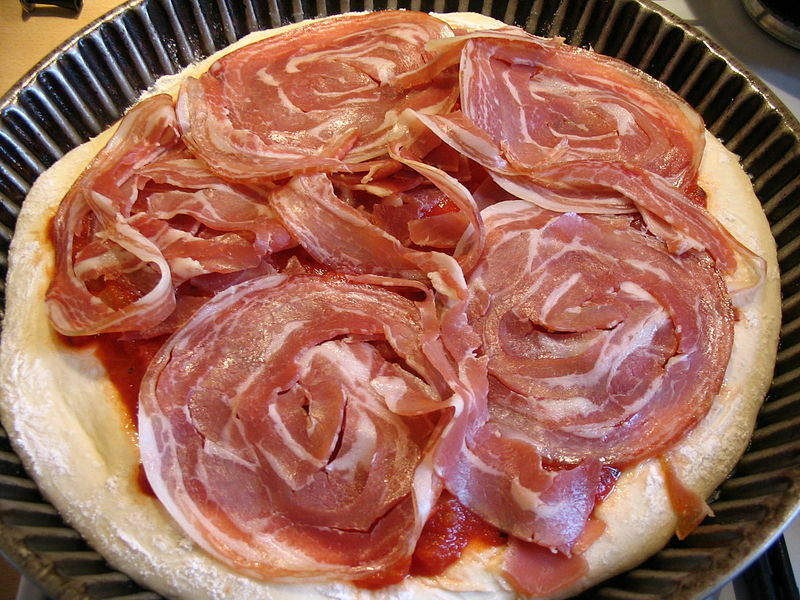 In America, we typically add cream and use meats such as ham, turkey or chicken instead of pancetta. Or, we make it vegetarian (but not vegan) by omitting the meat and adding mushrooms or onions. But to be truly authentic, no cream is used; only eggs, oil and cheese make up the ‘creamy’ sauce. Pancetta or guanciale, both from pork, is added for meat. This is the classic Italian dish, adapted from Culinaria Italia (1) and Fine Cooking (2). The pan should be hot, but off-flame when adding the eggs. Let the hot pasta thicken the eggs, rather than the heat of the pan. This is done by adding egg/cheese mixture to pasta in the pan, rather than onto the bottom of the pan; then, using 2 wooden spoons, lift the pasta to allow the sauce to coat all sides and thicken. Let the pasta fall back into the pan and lift again. Repeat until all the pasta is coated with the thick sauce. The best pasta for Carbonara is spaghetti, bucatini or linguini. Fettucini can be used in a pinch, but the skinnier the better – and the more sauce it can hold. Tubular pastas (like macaroni) do not work well with carbonara. Bring egg to room temperature. Dice pancetta and grate cheese. Peel garlic; dice onion. Heat olive oil in skillet over medium heat. Add pancetta and whole garlic and saute 4 – 5 minutes; add onion and continue to saute until brown and crisp, 4 – 5 minutes more. Remove from heat but keep warm until pasta is drained. Discard garlic. Beat eggs in bowl with about 1 Tbsp of the cheese and a pinch of salt. Cook pasta in large pot of boiling water over high heat until almost al dente. Drain well in colander. Add pasta to pancetta & onion in skillet over medium heat. Add egg mixture, and quickly toss until the sauce coats the pasta thickly, about 4 minutes; be careful not to boil, or the eggs will scramble. Reduce heat or remove from heat if necessary. Remove from heat and add the remaining cheese. Toss again with a little pepper and serve immediately. You can also add salt, but be careful as the pancetta is quite salty. Serve with a salad of greens, ripe tomato slices, and a light vinaigrette. A side of brined olives is a great accompaniment. This entry was posted in Dairy, Eggs, Fat or oil, Onion family, Pasta, Sauteed and tagged eggs, garlic, olive oil, onion, pancetta, parmesan, spaghetti. Bookmark the permalink.